In Vienna and Prague we were in orchestral concert halls. 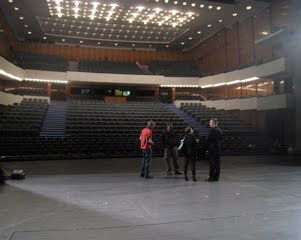 In Bratislava and Brno we have been in opera houses - a whole different vibe. The stage of the Janacek theater is HUGE... and of course rather than rows of double basses as in Vienna, there were rows of spears of various periods and crutches. Made us think of Garrison Keillor's send up of an opera chorus which we sang on Prairie Home Companion a few short weeks ago..